Ffarquhar Branch Line Studios Reviews: Big World! Big Adventures! Big Problems. Alright, more information has been released with regards to next year’s Big World! Big Adventures! theme. I don’t usually do two posts on the same subject, but there’s so much to unpack, I thought “why the hell not?”. Especially since this new information has changed my opinion drastically. First of all, I’d like to apologise to the cynical fans that I lambasted the last time I talked about this. If you had made your arguments stronger, I would’ve understood your points of view much easier. Simply saying "I don't like this" didn't make me understand anything. That's why I was so abrasive with my criticisms of those opinions. As it turns out though, the statements in the Associated Press report spoke for themselves. And they revealed that those cynical fans were absolutely right to be as pessimistic as they were. But what’s worse is that it revealed an incredibly ignorant, jaded view of a once iconic British franchise. Not just from the American media but the American company that’s currently in charge. Secondly... wow, are marketers out of touch with... reality, actually. They keep losing money with Thomas & Friends yet their best response to this - their best response - is to look at other shows, that have different premises, and say "yep, this is what Thomas wants!". There's very little I can add to what's been said, but I'll do what I can. Let's break down every single behind the scenes problem with this whole thing. What about that new Super Station they keep adding to the Thomas Creator Collective (not all fans are online, Mattel!)? Very few, if any, of their new products are advertised away from social media these days. And if Mattel can't be bothered to advertise on a broader scale, how the hell can regular customers be expected to know when new products are released? And then there's the Day Out with Thomas events, which have pretty much disappeared in the UK since the 90's. Whether it's down to higher costs, more paperwork or something else, those events brought custom to the heritage railways and focus onto the show. Parents took their kids, and everyone knew that Thomas was still around. Nowadays, there are only 19 locations doing them (check the list here). And while that's an OK number, many more have been scrapped (The Talyllyn still holds something akin to one, but even that is unofficial due to legal troubles in the late 90's.). Hell, I can even remember going to ones at the Foxfield and Churnet Valley Railways, both of which are gone now. Yep, I haven't forgotten this. Since Mattel took over, merchandise in the West has become worse and worse. It started with Trackmaster. To be frank, I've never been a fan of this style, even when the range was made by TOMY. They never really clicked with me for some reason. But even I can tell there's been a quality dip. The marketing says the new versions are meant to look "more realistic". But to be blunt, the left Thomas looks much better than the right. The proportions look better and the traction tyres seem better designed. Not only that, but every engine shares the exact same chassis. Because of this, some characters had different wheel configurations than you'd see on screen (to be fair, Gordon, Henry and James have always had this issue). The biggest victim of this being Edward. The front wheel was red, he seems to have a 2-6-0 wheel configuration and he looks like a barrel on wheels. Granted, the tender's detailing is actually painted on, not stuck on. But I'd still rather have the left one as it feels like Edward. Then you have the diecast range. Honestly, it's the range I like the most these days since Adventures toys look like Take n Play crossed with ERTL, But even I'll admit that the range has dipped since 2013. The proportions looked perfect and those magnets were excellent. Then they replaced the magnets with Wooden Railway ones, meaning they were less versatile and they became an eyesore. Couple that with tweaks to the moulding that made certain areas look a bit squashed and you're left with a toy that was just... OK. The toys aren't perfect now: they carry over the moulding problems and the plastic couplings have their own flaws (they can't connect to any toys from the previous 12 years and they're more prone to damage despite their thickness). But at least they feel like a step up. That said, the tender engines are pretty bad. The tenders only have four wheels and Henry has the same tender design as everyone else. And while that's great for fans of the books (Henry gained a Fowler tender in recent volumes), it's not for TV accuracy. The worst, though, is Edward. The problem is that... well, just compare the two above. Only 6 visible wheels (all of which act as driving wheels). the body looks squashed, the only front wheel is moulded into the undercarriage. It's just a mess all around, and it doesn't feel like Edward as much as the diecast toys from yesteryear. I include the Take Along version in that statement. And the faces on those were really bad. And then there's the Wood(en Railway) toys. I stand by what I said: fans should've let the toys speak for themselves because... wow, are the new ones atrocious. Yes, there's more defined details added (buffers, running board, proper wheel arches), but everything else looks unfinished. Kinda like the Bachmann James, only this affects the entire range. Up until last year, the quality of the range was great. Now they've flushed that quality down the pan. And it's not just older fans noticing. Parents, the target audience and autistic fans have not reacted well to this either. And I really don't blame them. I'd guess that the money that's been saved from the toy redesigns has gone into BWBA. Now I have a huge problem with this. And it's a problem that greedy game publishers don't get either. When development costs needlessly skyrocketed, and game sales were decreasing, they implemented worse and worse business practices. Pre-order bonuses, DLC, season passes, "cosmetic" microtransactions and now loot boxes (which go hand in hand with the microtransactions because... of course). All the while, the standard product has had less and less content put into it and less and less variety. Nowadays, games are all about open worlds, grinding and levelling up, offering "services" and online multiplayer (forced or otherwise). All of this because big businesses have failed to understand something important. It's a concept I know only too well with the way I've been brought up. It's called "living within your means". Meaning you can only work with the resources you have. If you want an example from this very show, go back to series 3. It's obvious to anyone they had big ideas for it, most notably attempting to adapt Gordon Goes Foreign. Why didn't it happen? Because Britt Allcroft and David Mitton couldn't afford it due to budget restraints. Instead of doing what Mattel have done now (reallocate some of the budget from the merchandise to the show), they dropped the idea. To get themselves out of the plot hole they found themselves in, they tweaked the start of Time for Trouble. And while it wasn't ideal (it seemed odd that Gordon would be rested after doing his normal duties), it was a fair workaround and worked for the budget they had. But Mattel isn't Britt Allcroft. They care only about money, like every other company. And if you think otherwise, I don't know how much evidence you need to be proven wrong. The problem is they don't care about making some money, like Thomas was making. They only care about making all of the money. Niche markets and individuality no longer matter in terms of kids TV or video games. They have to follow all of the trends, not realising the trend starters have already made all the money. The followers are desperate to copy those winning formulas in order to get a slice of it. And that idea is doomed to fail. What's worse is that the current style of storytelling has been ridiculed constantly while building up this new format. Look at how much the media constantly references the fact that Thomas is "trying to keep up with Disney or Nick Jr", attempting to remove the "stodgy" and "slow" storytelling the show's known for. The same thing happened with platforming games, horror games, single player games. Here's a newsflash for Mattel and those media outlets praising this cynical product: the storytelling style you criticised is exactly what kids tune in for! If they wanted Disney or Nick Jr styled shows, they'd watch shows on Disney or Nick Jr, not some show that's desperate to emulate their success! It's a bias that the media has had against the show for years, and it's been absolutely disgusting to read about. There's the non-troversy with Henry from idiots who don't understand that kids need to learn to behave as early as possible. There's been criticism about it being male dominated which, while fair, has never factored in the "quality over quantity" argument (nor do female dominated franchises ever get accused as such). And then there was a report years ago on how the crashes would adversely affect kids (although that was after series 5 I think. So I'll give them that). There are many others. But spinning the calm, well paced stories that Thomas was known for as negatives does nothing to help the industry as a whole. If every show is a fast paced laugh fest with no real care for actual storytelling, kids will ultimately get burned out. Even in this fast paced world they're being raised in. They need something calm and soothing to help them relax. Thomas used to offer this, but now only The Clangers does (to be fair, that's a fantastic reboot. I just hope America never gets their hands on that). And then we have the new main characters. There's two problems with... actually, there's quite a few issues, but here are the major ones. First off, they've swapped out two of the most well known characters with two that have appeared from nowhere. Yes, it's nice they're bringing in new female characters (but I'll get to that next). And I've no issue with new female stars. But they need a chance to prove themselves to the audience before they're thrown in at the deep end! Sure, Emily's inclusion from series 8 was controversial. But at least she had a few episodes in series 7 to develop her character before they added her to the main cast. Nia and Rebecca have had no such luxury; they've basically been hastily thrown in with no character and no safety net. So if this little experiment flops, the characters are rejected and their personalities aren't strong enough (or expanded on)... then what? Are they going to do what Hasbro did with My Little Pony and become desperate for their new OCs to be liked? So much so that they'll force the characters into every interesting story to try and manufacture audience interest? The problem that Ian has pointed out is not that female characters aren't in the main cast. It's that the roster of characters is far too big. The Railway Series had a small cast of characters. All of which felt necessary,. all of which had enough focus to identify with them. Since series 5, that was no longer the case. Think about how many have been tossed aside and forgotten solely because they need to pump out a new batch of characters every year to make more money. None of them (male or female) ever stand a chance because they're being introduced for the wrong reasons. The cast is so bloated now that there's no chance for all of them to get enough screen time. It's the biggest problem with introducing characters for profit. Although that's not the only problem, and I'll get to that in a bit. The second counterpoint to Ian's statement: he's complaining about "female characters falling into the background". That's fair enough, but I have an important question. Why not use those neglected female characters instead of bringing in two new ones?! You completely overhauled Rosie's physical design! What was the point if there's a possibility that she could join the other characters on the forgotten pile? Also, if you wanted international representation, let me re-introduce you to Ashima. You know, from The Great Race? How about Freida? Or Gina? Oh wait, they've already made Mattel as much money as they can, so they're practically useless to Mattel now... Sure, they may be featured in this pet project in some way. But how big (or small) of a part will they play? I've complained about the cynical business side, but there's a creative issue as well. The fact is these female characters aren't forgotten because they're not in starring roles. It's down to laziness from the writers. Sure, Rosie has been overhauled, but her character so far is incredibly bland. Likewise with Ashima, who has the typical "I'm a girl with confidence" persona that almost every single animated female for children has these days! There's more to women than that! Wonder Woman (not really animated, or for kids, but she's still a great character) is a naive badass learning about the world around her. Judy Hopps was optimistic, witty, intelligent and determined. Bellwether was shy yet manipulative. Writing a female character is one of the easiest things in the world, especially for this show. Have the mindset of writing a male character, swap the genders and you're done. How's it so difficult for some writers to comprehend that? If you want a prime example of a brilliant female character from this show that hasn't faded into the background (I'm not counting Annie, Clarabel and Henrietta since they're main characters by association)? Daisy. She's flamboyant, flirtatious and arrogant. She's been the most entertaining and stand out character with these traits alone. But she's also developed so much in that time. She knows not to take friends for granted. She knows when to put her vanity aside to help in bad situations. She took passengers home on a bad spring (yes, Skarloey did too. But he was doing what came naturally. Daisy's incident was amazing character development). Everything that's been done with her since her return has been nothing short of wonderful. And she's become one of the best characters in the CG era, and one of my favourite characters ever. I'd go so far as to say she's far better now than her book and classic series counterpart were. All of this was achieved while she was a side character with no merchandise. She was written by writers that cared about creating a good character, not as part of a cynical PR stunt made to garner favour with the media. Speaking as someone who's left leaning, and wants more inclusivity in film and TV for women and LGBT characters, that's the best way to go about it. Here's more evidence as to why begging for media attention doesn't always pan out. Remember the reports on Journey Beyond Sodor that focused on autistic Theo and gender fluid Lexi? It turns out most fans ended up preferring Frankie, the female character that got no media attention whatsoever. She was coercive yet charming. Angry yet sympathetic. There were flaws in her design (her motivations weren't that strong), but she was the one that fans talked about the most. Meanwhile, Lexi was considered overbearing and annoying by a large majority. I could mention other examples like Marion and Millie and how well they've been written, but I think I've made my point. There are loads of brilliant female characters. But due to a combination of corporate greed and creative incompetence, they're all lost in the shuffle. And with Thomas going around the world for half the episodes next series, that problem will only get worse. I do hope Nia and Rebecca are well written characters that deserve to be in the roles they're given. But the fact is there's so much working against them that it's incredibly hard to ignore the flaws in the argument for their inclusion. Also, I'm not going to say that this is "SJW pandering gone too far" should things not work out. My blog posts (this one included) have shown I can create counterarguments and thought provoking critique without resorting to overused buzzwords and non-criticisms. If Nia and Rebecca are poorly written, it's because they came from the same writers that created Porter, Timothy and Merlin (I like all three in terms of design, but their characters are so dull and uninteresting). But now we come to the biggest problem! So the entire premise of this reboot renders the character designs completely pointless. All of them. Remember back in the books and classic era where (more often than not) the stories revolved around railway mishaps while still being grounded for everyone to enjoy? Runaway engines, frozen points, bricked up in tunnels, busted brake pipes. They were all vital in teaching important lessons in that particular world. Even these days there's been frozen turntables, busy dockyards, slip coaches, PA systems. 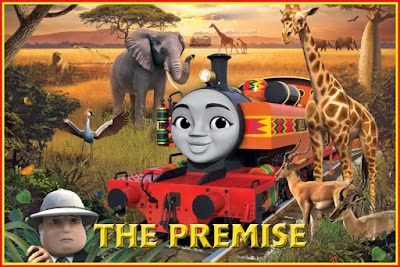 Quite a few of the stories have justified the need for this to be a show about anthropomorphic locomotives (or vehicles) working on a small island. From what I've seen up to now, this... doesn't. At all. The show will be teaching kids about world geography, cultures in other countries and climate change. That's perfectly fine... but they all go against how this show is designed. You could replace the engines and vehicles with humans and the end result would be exactly the same. Hell, considering the characters will be talking to the audience, this may as well be Dora the Explorer (side note: that new Dora film from Michael Bay's production company will be an incredible train wreck, mark my words). Also, the trucks tilting like this is overkill. I liked that the movements in series 21 and Journey Beyond Sodor give characters more expressiveness. This, however, is what fans feared those movements would be. I know it's always been a fictional railway, but that sense of grounding the franchise started out with made it feel real. Over the last two years though, that's been eroded more and more because "kids want vibrancy". I've said it before, but if kids want that, they'd watch a show with vibrant stuff in it! Finally, there's the new theme tune. Yep, a new one. Two years after it was changed. It's the fifth change throughout the show's lifespan (technically the third and fourth were tweaks of the second, but still)! Like the show changing to "keep with the times", the theme tune change has the exact same feeling to it. It's a desperate cloy to stay relevant from a show that shouldn't need it. The theme itself isn't terrible. It's fast paced and modern, like the show is attempting to be. But it's simply not as memorable as the themes it replaced. And, like the premise, it literally could've been written for any show. The others were less in your face and had more charm to them, which is where the show excelled. It's also incredibly similar to Set Friendship in Motion, so it has laziness going against it too. I'm more than willing to support the writers and producers of this project. Had they been asked away from their corporate overlords, I imagine they wouldn't want this. But this is where they're at, and they've got to do their best with a bad situation. Can they pull it off? Possibly. But the fact is this world travelling nonsense isn't Thomas. What it is is a cynical corporate mandate from an American company that cares only about making all the money it can because that's the only mindset it has. There's no such thing as a niche these days; you either become mainstream or you're not worth investing in. I've emailed Mattel daya ago to tell them about my feelings over the upcoming Big World, Big Adventure, and guess what? ...they ignored me! Shows they really don't care at all. That’s not a case of them not caring. It’s a case of them not answering. I imagine that’s not the first email they’ve got about this and it won’t be the last. They can’t answer them all. I'm surprised no one blasted this telling you "you just don't like change"
It’s easy. First, I’m not going round saying “I don’t like this” for no reason. I’ve laid out every single problem and why the excuses are nonsense. Second, disliking this direction is a majority opinion; they simply want a bigger mouthpiece to explain why there are issues because they can’t do it themselves (for whatever reason). You, Chris, are a GENIUS. I may not agree with you on everything regarding this show, like how good or bad Season 5 is, but this... I couldn't have said it better myself. Sort of. The major difference is that Microsoft's destruction of Rare was instantaneous, and was done for no other reason than "because we could". 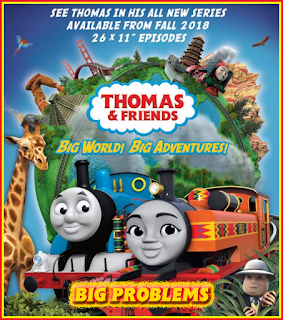 This was announced five years after they took over and was only done out of fear because Paw Patrol and other enticing shows came along and took an audience that Mattel thought should've been theirs. What they don't seem to realise is that they're in control of a show about talking locomotives, and that isn't going to be every child's cup of tea. The difference between those examples and this is that platformers (at least, I don't know about the others), honestly had at least some sort of safe haven at Nintendo. Yep, it’s the exact same issue. Someone says “we need to do ___ because the data tells us they want it”. What the data doesn’t tell them is that, no matter how much they try and emulate the popular thing, it will never beat the popular thing (unless the popular thing destroys its own reputation and something better comes along). They said survival horror was dead, yet PT came along and destroyed that argument. They wanted to kill platformers, yet the Crash remakes has sold millions of copies. Spyro’s remakes have so much hype surrounding them. And, yep, Nintendo’s offerings are still incredibly popular. Heck, Rayman Legends is brilliant, and has been ported to every current generation console. Thomas has the same problem. They say the show’s become stagnant, yet the move to Nickelodeon has drawn around a million viewers each day. The Wood range wanted to show off more of the material, yet parents and older fans are solidified in saying they look unfinished. On the bright side, Edward's decreased role was not as serious as what many feared. At this point, the only things they would really need is to slow the whole pace down and stick solely to Sodor. Plus maybe bring the narrator back (mostly because it's just better with the narrator). Of course Edward’s decreased role wasn’t that serious. Fans have been conditioned into thinking that Edward should forever be a main character. They’d forgotten, however, that his best roles were supporting roles. The only good starring role he had was Edward’s Exploit in 1986. Every other good episode he had major involvement in, he was a supporting character. As for what needs changing? The writers need fresh, interesting ideas. They can take place wherever they want the stories to take place, that shouldn’t matter. But so many episodes had either uninteresting premises (in that we’d seen the concepts multiple times before) and boring (even horribly botched, leading to terrible lessons) executions. And however fans want to dress it up to avoid the conversation/unfortunate truth, that’s not Mattel’s fault. The blame lies at the feet of the writers for not making the ideas work. If they don’t want to turn more people away, they need to improve their writing skills and think of some fresh ideas. If not, Mattel need to hire better writers. Hell, just bring back the narrator instead of Dora-style fake interactivity, slow down the pace, then remove some of the dumber fantasy sequences, and even the worst of the International episodes would become somewhat passable by me. Hell on the subject of Edward, I'd say we should just do away with the steam team premise altogether. Or if we can't completely bring back the narrator, why not something like TUGs and have the Fat Controller narrate a la Captain Star. “Or if we can't completely bring back the narrator, why not something like TUGs and have the Fat Controller narrate a la Captain Star” ...you realise this is what the show is like now, right? The main bulk of an episode now is 7 minutes. The bits at the start and end can be skipped entirely and nothing would be lost. There’s really nothing wrong with that interactivity; it’s designed to keep preschoolers (the target audience) engaged, not teenagers or adults. You also talk about “slowing episodes down”, but I watched every single one, and they all felt as slow/decently paced as the rest of the episodes the show has produced. Maybe some episodes had parts that were rushed, but when you suddenly have 1:45 less to work with after 5 years, it’s going to take some time for the writers to adjust. I’ve said it before and it bears repeating: even if they revert back to the way things were, it still won’t fix the show’s main problem. That problem is that there’s no creativity left in the storytelling. I’ve noticed the team recycling ideas since season 19, and it reached its nadir in season 22. And if they weren’t being lazy, they were being sloppy. Time constraints are not an excuse for this; most of the episodes that fans love run at 4 and a half minutes (minus credits). The problem is a lack of talent. As far as the “Steam Team” goes, considering how many different characters have had starring roles since season 17, I wouldn’t be surprised if they only kept the name for marketing purposes. I think if anything they ought to go back to adapting a few Awdry stories if the lack of creativity is that serious. I remember enjoying when they adapted the Small Railway Engines stories. But that’s only going to highlight the fact that they’re out of ideas even more. Case in point, what have the small engines done since those episodes? Pretty much nothing. In hindsight, that was the writers saying “we can’t think of anything for them, but we have to include them somehow. Let’s just adapt their original stories”. It would make fans happy if there were more adaptations produced, but it wouldn’t deal with the underlying problem, especially since there aren’t many stories left to adapt.